In September 2015, the US Environmental Protection Agency (EPA) announced its discovery of software manipulations in Volkswagen diesels. Two years later, have car buyers given up on the technology? But the move to ban diesel cars from city centers could have an immediate effect. Cities such as Paris have begun banning old diesels from parts of town. A German court recently ruled that Stuttgart, Germany (home to Mercedes and Porsche) could implement a similar ban on old diesels. Depending on how you read the ruling, the city might even have been obligated to instate the ban as soon as 2018. But in early October, the state government of Baden-Württemberg (led by the Greens) asked the court to review a number of legal aspects, thereby postponing the ban indefinitely (report in German). In the first half of 2017, more gasoline cars were sold than diesels in Europe for the first time since 2009. 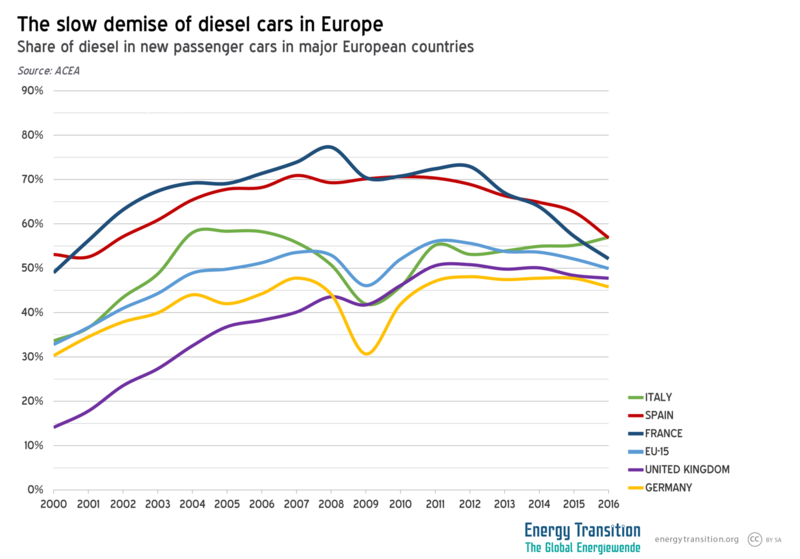 But as the chart below shows, there hasn’t really been a major change since the diesel scandal broke. Diesel sales are down, but other factors seem to be bigger. France has seen a slowdown since 2012. And the big dip in 2009 was the result of the economic crisis – even though the chart shows the percentage of diesel in all car sales, not absolute sales numbers for diesel cars. In France, one reason for the shift in sales away from diesel is the increase in smog in Paris, which has been an attention-grabbing problem since at least 2014, when the government raised the tax on diesel. In Spain, sales also started slipping in 2011, but the real downturn came in 2016, when Madrid began discussing banning diesels (see this great blog post from the International Council on Clean Transportation). In Germany, the outlier is 2009 – and the reason was the country’s Cash for Clunkers program of 2009. After the financial crisis of 2008, German carmakers saw sales plummet as people kept their cash in their pockets out of uncertainty about their economic future. Then, the German government offered a bonus of 2,500 euros for people trading in cars at least nine years old for a new one. The program’s name was actually the Environmental Bonus, and it could not target German carmakers lest trade rules be violated. This brief change in the market may have also helped German carmakers, but the real winners were manufacturers of small cars, such as Hyundai, Suzuki, and Fiat (report in German). Luxury car sales were down, and since German carmakers produce lots of them, they benefited less from the policy. The incentive mainly gave drivers of inexpensive vehicles an incentive to upgrade immediately. And as the chart below shows, foreign car firms mainly sell (small) gasoline engines. 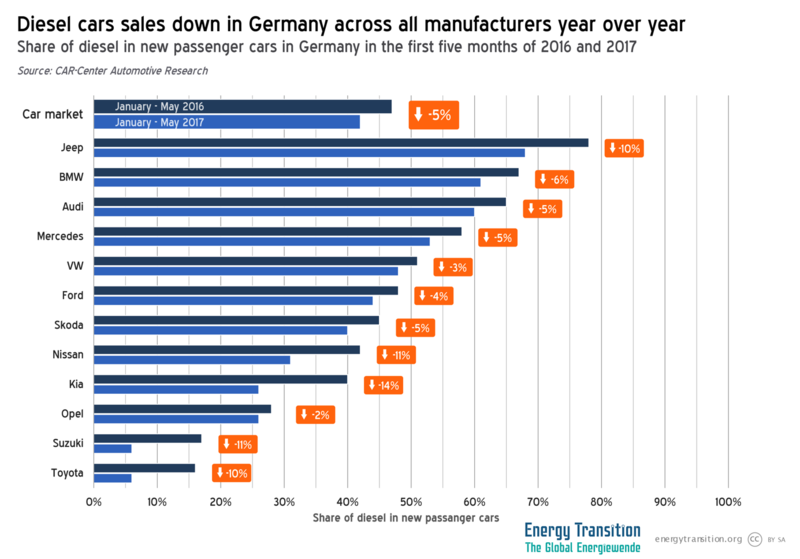 Here, we see that – with the exception of Jeep – German carmakers top the list in terms of the percentage of diesels in total sales. At the bottom, we find leading international players. And the share of diesel of dropping for all of them. In the end, the data suggest that there have been much bigger factors in the downward trend in diesel sales than the software scandal. But maybe the effect is just getting started, as news about cities possibly banning diesel remains in the headlines. 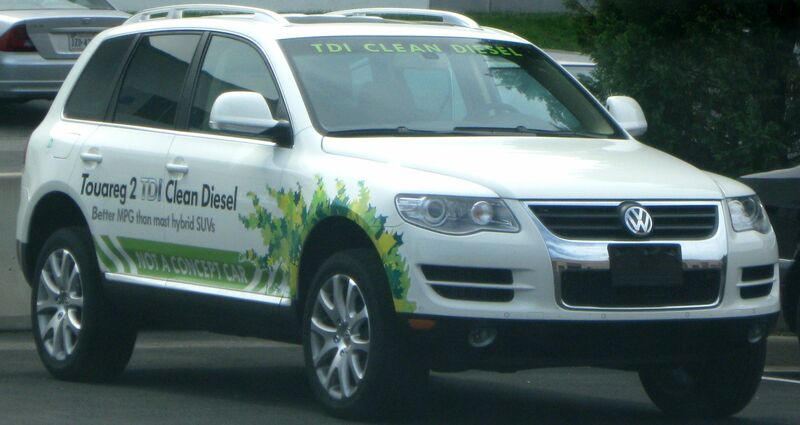 In October, the German Office of Motor Vehicles announced that the share of diesel in September had dropped to 36%, down a full 21 percentage points from September 2016 (press release in German). And for the first time ever, plug-in electric vehicles made up one percent of sales in Germany. All-electric cars also came in just below one percent. Put together, this may not sound like much. But the demise of diesel may have finally reached critical mass in Germany, the country that arguably made diesel what it is today: a technology of the past. “Plug-in electric vehicles” is a set of which the subsets are “battery-electric vehicles (BEVs)”, “plug-in hybrid vehicles (PHEVs)”, and “plug-in fuel cell vehicles” (the last set being empty).